Within our curriculum documents, the areas of reading, writing, foundational skills, speaking, listening, and grammar are addressed at each grade level, meeting the standards set forth by the NJ Student Learning Standards for English Language Arts. Because the English Language Arts are so highly integrated and interdependent, a balanced approach to instruction is therefore required. Characteristically, the development of literacy skills requires a spiraled curriculum where concepts are introduced, developed, and reinforced. Once introduced, most skills are repeatedly revisited within that grade level. They are reinforced in successive grade levels with increasing rigor and in greater depth. This course includes reading, literature, grammar, spelling, punctuation and vocabulary. Comprehension and appreciation are taught through study of thematic anthologies, novels, and non-fiction. Students develop skills in persuasive, narrative, descriptive, and expository writing. Technology use is incorporated into the program in a variety of ways, including for research. English is integrated with other subject areas whenever appropriate. This course includes a study of literature (novel, short story, poetry, and drama), composition, grammar, vocabulary, spelling, speech, and listening skills. During the year, there is a review of study skills and test-taking strategies. Technology use is incorporated into the program in a variety of ways, including for research. English is integrated with other subjects whenever appropriate. This course has students studying a different type of literature each marking period including mythology, drama, novel, and short story. Major vocabulary units include a dictionary study and misunderstood word pairs. Grammar instruction is focused on punctuation. Composition assignments may reflect current literature readings, personal experience, or writing forms such as business letters. Effective Grade 8 public speakers are expected to use visual aids. Technology use is incorporated into the program in a variety of ways, including for research. English is integrated with other subjects whenever appropriate. Remedial instruction is intended to provide additional support in ELA for identified students in grades six to eight. Families will be notified as to whether their child qualifies to receive such services. Each student is required to read one additional book from the list for the grade level they will be entering in September. The first writing assignment of the new school year focuses on one or both books. Therefore, it is essential that students complete these required reading tasks. Students best acquire mathematics skills when they are engaged in activities that enable them to discover, understand, and apply mathematical concepts. When students are challenged to use mathematics in meaningful ways, they develop their reasoning and problem-solving skills and come to realize the usefulness of mathematics in their lives. The Board of Education has set a goal to make Summit the leader in STEAM education. STEAM--Science, Technology, Engineering, Arts (design) and Mathematics--is an integrated way to deliver curriculum and instruction offering problem-based authentic opportunities for learning. This approach is reflected in many courses across the curriculum. Pose and solve real world problems. Make connections within mathematics and between mathematics and other areas. Provide opportunities for active student involvement. Accelerated Math 6 is intended for highly motivated students who demonstrate mastery of basic computational skills and display problem-solving ability. In addition to extending whole number, fraction, and decimal skills, students work with positive and negative numbers, ratio and proportion, percent, algebraic equations, and geometry. Math 7 reviews, reinforces, and extends computational skills to include fractions, decimals, and percent, as well as an in-depth introduction to integers. Building a solid foundation of understanding of the number system is a major goal of this course. Units of study include geometry, statistics, and algebraic thinking. Pre-Algebra 7 is designed for highly motivated students who possess excellent quantitative skills. Students study traditional topics in numeration and computation using an algebraic approach including geometry, applications of ratios, proportions, percent, and statistics. Concept development and problem solving are a critical focus. Pre-Algebra 7 Enriched is intended for mathematics students with excellent quantitative skills and demonstrated capacity for dealing with abstract concepts. Algebraic and geometric concepts are taught in an interrelated manner. Arithmetic procedures involving fractions, decimals, and signed numbers are solidified. Units involving statistics and geometry are also presented. Pre-Algebra 8 is intended to encourage students to think mathematically and is designed as preparation for future studies in Algebra and Geometry. Skills required for algebra, geometry, number theory, patterns and functions, data, and problem solving are studied. The instructional approach balances the skill-focused units with problem solving-based applications designed to develop a more algebraic approach to thinking and reasoning. Foundations of Algebra was developed for the students who are prepared to begin their exploration of Algebra 1obtaining mastery of the skills, techniques, and concepts necessary for success in future mathematics courses. This course includes an exploration of the properties of the real number system, fundamental operations with real numbers and variables, solving equations, inequalities, linear and non-linear relationships, and linear systems. Students develop these concepts numerically, graphically, and analytically. 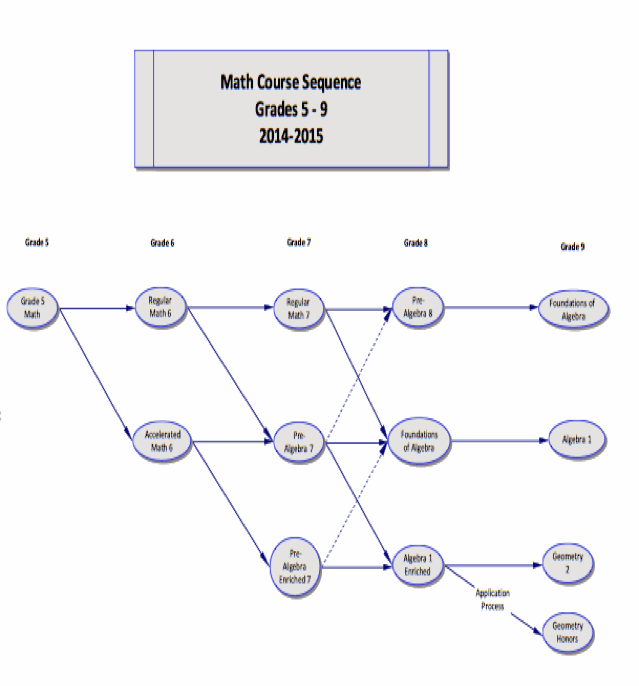 In addition, students will apply their skills in all strands of mathematics through authentic problem-based experiences that focus on the connections between algebra and topics involving geometry and data analysis. Algebra 1 Enriched provides a challenging, in-depth experience with the three key elements of Algebra: equations and inequalities, graphing, and interchangeable use of words and symbols. An important goal of this course is to lead students toward more independence in their learning through continuous previewing and reviewing of concepts. Complex applications of Algebra are introduced as the traditional skills are developed. Strands involving informal geometry, probability, statistics, and discrete mathematics are interwoven throughout the course. The Math Strategies program is designed to support students who need additional support in mathematics. Through small group instruction, students learn strategies to help them achieve according to the NJ Standards. The course will provide students with differentiated instruction and varied opportunities to work toward improving achievement. The program recognizes individual learning differences and strives to build students’ competence and confidence. The district is committed to providing instruction that aids students in displaying academic growth in order to be successful in all aspects of the curriculum. In addition to the NJ Student Learning Standards for Science, the English Language Arts (ELA) Standards include supplemental guidelines for literacy in science and technical subjects. Teachers of science use their content area expertise to help students meet the particular requirements of reading, writing, speaking, listening, and using language effectively for college, career, and life readiness. Using primary and secondary sources, students are challenged and asked questions that push them to refer back to and to apply what they’ve read, emphasizing critical-thinking, problem-solving, and analytical skills. Within our curriculum documents the standards are addressed at each grade level with increasing rigor and in greater depth. Over the past 4 years, there has been a Science program revision reflecting an integrated and spiral design providing students with science courses that are relevant, cater to student interest, and provide authentic opportunities for problembased instruction. The new courses are designed to integrate all three Sciences (Life, Earth, and Physical) at each grade level with an inquiry-based, hands-on approach. This interconnected approach to learning is necessary to prepare our students for the 21st Century skills that are required of scientists. As concepts are reinforced throughout the year and across multiple years, students should show increased engagement and mastery of the content. The integration of all three sciences give students a broader understanding and appreciation of the interrelationships between the physical and natural sciences. This course provides students with a thorough, relevant, and engaging standards-based curriculum that focuses on implementing the scientific and engineering practices, as well as the cross-cutting concepts based on the core ideas outlined in the standards. Problem-based learning experiences, 21st century skills, and engineering design processes are emphasized. Specific topics that are studied include Matter and its Properties, the Water Cycle, Cell Structure and Function, the Interdependence of Biotic and Abiotic Factors in Ecosystems, Energy Interactions, and Plate Tectonics. A hands-on approach promotes investigation and discovery in learning the fundamental skills of observing, classifying, measuring, predicting, forming hypotheses, interpreting, and experimenting. Technology tools are used for research and to reinforce and extend curriculum concepts. This course provides students with a thorough, relevant, and engaging standards-based curriculum that focuses on implementing the scientific and engineering practices, as well as the cross-cutting concepts based on the core ideas outlined in the standards. Problem-based learning experiences, 21st century skills, and engineering design processes are emphasized. Specific topics that are studied include the Relationship Between Forces and Energy, Chemical Reactions, Photosynthesis/Cellular Respiration, Symbiotic and Interdependent Relationships, the Energy and Matter Cycle, and Weather and Climate Patterns. Students work both individually and in cooperative teams solving problems, using decision-making skills, applying math skills, and planning and conducting experiments. Technology tools are used for research and to reinforce and extend curriculum concepts. This course has students continue to develop science skills and an understanding of science concepts through the investigation of planet Earth and our Universe. Emphasis is placed on the interrelationships among astronomy, meteorology, geology, and oceanography. Concepts studied in grade eight are more abstract than in those in sixth and seventh grade. Current issues in environmental science and technology are blended into the curriculum. Activities are designed to extend and clarify basic information from materials and classroom discussions. Technology tools are used to reinforce and extend curriculum concepts. Students learn to apply scientific principles to research and solving problems. The Summit Public Schools shares the vision of the NJ Student Learning Standards for Social Studies to provide all students with the information required to become informed and responsible citizens who are able to contribute to society. The standards provide a framework to foster in students the development of an understanding of the world as our shared home, and an appreciation of our American heritage. The objectives identified are attained through the achievement of student literacy in four major social studies disciplines: civics, history, economics and geography. While each discipline contributes its own unique perspective of the world as our home, it is their integration that produces a truly literate understanding of history and social studies. In addition, the English Language Arts (ELA) Standards include supplemental guidelines for literacy in history and social studies. Teachers of history and social studies use their content area expertise to help students meet the particular requirements of reading, writing, speaking, listening, and using language effectively for college, career, and life readiness. Using primary and secondary sources, students are challenged and asked questions that push them to refer back to and to apply what they’ve read, emphasizing critical-thinking, problem-solving, and analytical skills. Within our curriculum documents the standards are addressed at each grade level with increasing rigor and in greater depth. This course introduces students to the origins and development of world societies and culture. The course, The Mapping of Man, explores the ways in which geography has influenced the origins of human civilization through an interdisciplinary and analytical approach. Additionally, the development and characteristics of culture, daily life, belief systems, transportation, economics, and communication systems are studied. Current events are discussed as they relate to the curriculum and the development of the student’s ability to become a critical thinking citizen in a democratic society. The 7th grade social studies program continues the student’s education in the history and political system of the United States begun in grades four and five. The course is primarily an American history course with a focus on civics. Geography, economics, and social studies skills are interwoven into the curriculum. As the students build upon what they already know about the creation and growth of our nation up to the reconstruction period, they will study the development and growth of the nation. New Jersey’s part in this process will also be covered, as will the importance of the contributions made by Native Americans, African Americans and the various culture groups that have become part of the legacy of our nation. The historical basis of this course allows for connections to other social sciences as they relate to the historical period. This will provide students with a better understanding of the social sciences within an historical context. Students will revisit and build upon American history from the early exploration period, to colonization, the American Revolution, the creation of the new nation, the early republic, the expansion period, the Civil War era, and the period of Reconstruction. As they study the United States political system, students will learn about the historical roots and development of the Constitution. The New Jersey Core Curriculum Content Standards for Social Studies and the Common Core Literacy Standards for Reading and Writing are evident throughout this course of study. During the year, an emphasis will be placed on social studies skills as students investigate topics and interpret facts and ideas. Media presentations, short-term group and individual projects, map skills, reading assignments, discussions, problem-based learning units, class presentations, cooperative learning, role playing, chart and study skills, technology based learning, and writing are all essential components of the program. Current events will be discussed as they relate to the curriculum and the development of the student’s ability to become critical thinkers as citizens in a democratic society. One of the most important purposes of social studies is citizenship education. In this course of study, as students come to understand the history of their nation and state, they also develop an awareness of the function of the political process itself. Emphasis is placed on the relationship between the institution of government and the individual. Students are encouraged to see themselves as potential forces for change both as individuals and as members of societal institutions. The 7th grade program continues the commitment of the social studies department in the Lawton C. Johnson Summit Middle School to orient students to all the major world regions and their contributions to world civilization, not least to the historical and cultural development of the United States of America. The 7th grade program will help to validate the cultural background of all students while developing awareness, tolerance and appreciation and will better prepare them to take their places as citizens of their nation and their world. The 8th grade social studies program will provide students with a thorough, relevant, and engaging standards-based curriculum that focuses on United States citizenship, civics, law and global economics. It will emphasize problem-based learning experiences, 21st century skills, and literacy across the content areas in a supportive, challenging environment for all students. Classroom activities will include case studies, mock campaigns, mock trials, using real time data, political debate and economic topics and create a government. Students will demonstrate knowledge regarding the structure and purposes of government, civic responsibility in a democratic regime, and the political process in the United States. Students will demonstrate knowledge regarding the structure of the U.S. government and various general structures of government. Students will demonstrate knowledge regarding the meaning and application of justice in our legal system. Students will demonstrate knowledge regarding the basic principles of economics and the effect on the United States economy. By its conclusion, the course content will provide a direct correlation with the LCJSMS Ryder’s Challenge and Washington D.C. trip. The combination of these events and activities will round out the 8th grade experience dealing with civics in a modern world and provide students with authentic, hands-on experiences. The Summit public schools provide an enriched arts experience for all levels of education that is aligned to the standards. In addition to the study of fine and practical arts, the study of performing arts in the curriculum enables students to develop critical thinking and problem-solving skills, organizational, planning, goal setting, research, idea formation, and observational skills, while also nurturing creativity and innovation. Through the arts, behaviors of sustained engagement, self-discipline, and persistence are developed that can then be applied to any subject and any aspect of life. Artistic experiences are provided at all grade levels and at all levels of artistic ability to develop the creative potential in each child and to allow for maximum individual differences in expression and growth. At LCJSMS music ensembles are scheduled five times during a three-week period. Students may elect to participate in only one of the three Performing Music courses for the entire school year. Band and Orchestra have a rotating lesson schedule. Grades 7 and 8 students choosing Band or Orchestra also have the option of participating in Lunchtime Chorus to obtain a vocal music experience. Grade 6, 7, and 8 Band is available and beginning lessons are offered to students who have not had previous instrumental music experience. Through special exercises and graded materials, students develop techniques of individual and group performance. The bands successfully perform a variety of ensemble literature, as well as the works of noted composers, popular songs, and contemporary compositions. Other performance opportunities include the Jazz Lab Band, Stage Band, Flute Ensemble, Morris-Union Jointure Commission performing groups, Region Band and Orchestra, and All-City Music Masters. Band groups perform frequently at assemblies, evening concerts, community programs, and music festivals. Grade 6, 7, 8 Orchestra provides opportunities through special exercises and graded materials for students to develop techniques for individual and group performance. Ensemble participation aids in developing discrimination in matters of intonation, rhythmic accuracy, tone quality, and dynamic contrast. Other performance opportunities include the Lawton C. Johnson Summit Middle School String Quartet, Chamber Orchestra, Morris-Union Jointure Orchestra, Region Orchestra, and All-City Music Masters. Orchestra groups perform frequently at assemblies, evening concerts, community programs, and music festivals. Grade 6, 7, 8 Chorus is a performance-oriented course that aims to develop knowledge and use of basic principles of good singing, appreciation of a variety of musical styles, enjoyment of a wholesome leisure-time activity, and a sense of accomplishment through participation in group musical performances. Self-discipline and cooperative learning are stressed. Chorus training includes part-singing, with attention to diction, tone quality, balance and blend, dynamics, and precision of attack and release. Special attention is given to the changing voice of the adolescent boy. All students are welcome to audition for the select choral group, Bel Canto. This group performs both in school and in the community. Members are coached for excellence in vocal and performance skills. Additional chamber groups may be formed when there are sufficient numbers of students available. Outstanding vocalists may also receive the opportunity to participate in Region Chorus, Morris-Union Jointure Chorus, and All-City Music Masters. The standards topics for grades 6-8 include Wellness, Alcohol, Tobacco, and other Drugs, Family Life, and Community Health Skills during Health classes, and Wellness, Movement Education/ Rhythm, Cooperative Games, Individual Activities, and Team Activities during Physical Education classes. All students in NJ in grades 1-12 are required to participate in a comprehensive, sequential, health and physical education program for at least 150 minutes per week each year. Every student in Grades 6, 7, and 8 must complete one quarter of Health. Students are scheduled during their Physical Education period. Topics explored are relevant to students' social, emotional, and physical development including personal grooming, safety and first aid, nutrition, mental health, family living, prevention and control of disease and health problems, sexuality, growth and development, drug education, community and world health, general health, and body systems. Problem-solving, decision-making, and consumerism are included in all areas of study. State-mandated drug, AIDS, and family life education are included at each grade level. Health curriculum emphasis is body systems, smoking and drug prevention, safety, and wellness. Health curriculum areas of emphasis are mental and social health, wellness, alcohol and other drugs, and the D.A.R.E. Program. The D.A.R.E. Program consists of ten of the health lessons. The health teachers work collaboratively with the local Summit Police D.A.R.E. Officers to teach this part of the program. Health curriculum areas of emphasis are growth and development, developing responsible relationships, human sexuality, disease prevention, and wellness. The study of languages is an integral part of every student's academic preparation. Students in Summit have the opportunity to study Spanish from elementary school through grade 12, study French, Mandarin, and Latin from grade 6 through grade 12, and/or to choose a second world language in high school. Students are encouraged to further their knowledge and use of their respective languages beyond the classroom through cultural activities offered throughout the school year. The primary goal of world language study is communications proficiency. In addition to enhancing understanding of English and connecting other disciplines to the world language course of study, students learn to communicate through practice and presentation in all four skill areas including reading, writing, listening, and speaking. Course content is presented thematically, with the newest curricula written using the Problem-Based Learning model, linking learning outcomes to dealing with real-life issues and situations. Units of study may include vocabulary, grammar, conversation, reading passages, writing samples, listening activities authentic media, and videos all designed to develop students’ ability to use language authentically. The cultures of the countries where the world languages are spoken are also studied through readings, authentic media, videos, and class discussions. All world language students are expected to use the target language to present information, interpret authentic materials in meaningful contexts, and to communicate with each other, as well as with native / heritage speakers. All students are expected to use language to connect to other communities and to view cultures from different perspectives. Summit’s world language curriculum is aligned to the NJ Student Learning Standards and to the National Standards for World Language Education, as well as, with the proficiency guidelines established by the American Council on the Teaching of Foreign Language (ACTFL). The program provides students essential knowledge and skills to be informed, contributing members of the global society. Novice language learners in Spanish, French, and Mandarin Chinese engage in conversations, present information, and interpret authentic materials in meaningful contexts on a novice level. Novice Latin students focus primarily on demonstrating understanding of spoken and written communication, as well as learning to use Latin within the classroom. Students participate in a target-language rich immersion classroom environment and learn to communicate about the essential topics of home, family, school, friends, activities, and self. Novice French students also study various Francophone cultures. Mandarin Chinese students learn spoken language, as well as the unique characters that comprise the Mandarin Chinese written language. Novice Latin students learn classroom expressions, explore the wide influence of Latin on other languages, read and translate Latin text, and begin to discover what is known about Roman life, culture, and mythology. Emerging level students in Spanish, French, Mandarin Chinese, and Latin continue to improve understanding of the target cultures and to develop communicative language skills. Students are provided ample opportunities to engage in conversations, present information to a known audience, and interpret authentic materials in the target language within a meaningful context. LCJSMS teachers work collaboratively to provide challenging and authentic learning experiences for the students. French, Spanish, and Mandarin Chinese students work in a target- language immersion environment. Latin students work in a Latin-rich classroom. Grade 7 and 8 students may enroll in Emerging, or Intermediate levels of Spanish, French, Latin, or Mandarin Chinese. Students continue to develop communicative language skills in target-language immersion classrooms. Culturally appropriate tasks enhance student understanding of the target cultures. Reading authentic texts, viewing current events from the Internet, and directed compositions are some of the challenges that prepare students for high school language courses. Intermediate Latin students continue to develop skills in communication, reading, and writing with an emphasis on history and mythology of the Greco-Roman world. Students read, analyze, and translate short selections in Latin. English as a Second Language Novice is for students who have a basic understanding of English. Students will learn about the English language as an art form and as a tool to communicate using appropriate English conventions. Students will enhance English skills in all four domains: reading, listening, speaking and writing. Students will strengthen critical thinking skills as well as how to apply those skills for success in the classroom and beyond. Each unit includes both authentic and adapted materials and resources. Students will also produce work based on these models while conforming to both NJ Student Learning Standards for ELA and WIDA Language Development Standards. The Art program in Grade 6 focuses on developing creative problem-solving skills, increasing artistic vocabulary, gaining insightful use of the elements of design, self-critiquing, expanding skills in computer graphics, and learning about various artists and cultures. Exposure to specific exercises in drawing, painting, sculpture, computer graphics, ceramics, and art appreciation is emphasized. In Grade 7 students build on skills learned in sixth grade and experience in-depth exposure to design problems and the use of diverse materials. Engaging in drawing, painting, fabric design, computer graphics, and art appreciation students create several personal projects based on the art of specific cultures. Self-critiquing, use of elements of design, and development of an artistic vocabulary are continued. The focus of the Grade 8 art curriculum is the development of skills enabling students to make conscious choices and apply technical proficiency as they learn to use the elements and principles of art. A student-centered learning environment motivates and challenges students’ creativity and self-expression around a unifying theme. This problem- based course culminates in a gallery opening filled with students’ self-selected body of work featuring the student as the unifying subject. Students also have opportunities to reflect in writing on the creative process, themselves, and the world through the eyes of an artist. Literature is an incredibly effective way to teach children, but it does not reach all students. Whether they are struggling readers, cannot connect with the subject, or simply do not enjoy reading. Simply stated, books can cause some students to shut down. Although they are not adequate substitutes, movies present alternative ways of telling a story. They also appeal to students who with visual and auditory learning styles. This course will examine the history of film ranging from silent films to moderns classics. Concurrently key concepts from other disciplines will be included into the curriculum in an attempt to lay foundational knowledge, reinforce existing understanding, or deepen understandings of topics related to the students’ core classes. The article “ Children, Adolescents, and Advertising” reveals that the average American adolescent views 40,000 advertisements a year on television alone. This staggering number screams to the need for students to develop an understanding of the persuasive techniques advertisers use, as well as the effects and implications they have on our lives. Since advertising has become so deeply woven into our society, it is now necessary to develop an awareness of how it shapes one’s perception of themselves and the world. It is only with this understanding that we will be able to remove the blindfold advertising has upon our lives. Advertising is not the only challenge posed by the media to our students. Students must also be educated on how to actively read the news and interpret reporting through a critical lens. The internet has increased access to a tremendous amount of perspectives. Some of these points of view are objective, some biased, and others completely false. Our students must learn how to weigh other’s opinions, as they begin to form their worldview. The ultimate goal of this cycle is to create an awareness of the influence of media on our students’ lives to promote decision making unburdened by the growing deluge of information they are exposed to on a daily basis. The course will provide students with opportunities identify and explore the roots of contemporary social issues/current events by researching the various components that exist within single topic. Due to the constraints of curriculum and timing, students are frequently not afforded opportunities to explore current events and other contemporary social issues on a regular basis. This cycle will attempt to both expose students to issues that affect their lives as well as instill within them an understanding of the complexity of these issues. In doing so, students will discover how science, history, technology, and language interact in the real world. Further, students will explore the existence of bias in the media as they research and discuss news from a variety of sources. General Music is designed to develop appreciation and further stimulate creative thinking and interest in music in Grades 6 and 7. Students are given a hands-on introduction to the language of music through the use of MIDI (Multiple Instrument Digital Interface) keyboards with an emphasis on right-hand playing, and are also exposed to music theory and music history, significant composers and basic methods of composing, which they practice on Sibelius, a computer software music notation program. Students have the opportunity to perform original compositions and ensemble pieces on the keyboard. In Grade 8, students engage in the creative process, developing, designing and performing in a musical production and building upon previously acquired skills in music and drama. Working in collaborative groups, students mount a polished production of an original or adapted musical consisting of short scenes and musical numbers that allow for solo, duet, and group performances. Given a global theme, students explore social, multicultural, and human issues, and incorporate them into their unique role within the musical presentation. The history of musical theatre provides the basis for in-depth study and application, and students are given the opportunity to become the playwright, composer, lyricist, actor, musician, dancer, choreographer, director, designer, or technician. Students have the opportunity to reflect on their contribution to the creative process and final performance through self and peer assessment. Intro to Technology/Technical Education is a 6th or 7th grade required STEM course designed to introduce students to the world of technology. Students in this introductory class are introduced to the meaning of technology and its relationship to science. They are also introduced to the Engineering Design Process (EDP) and its application to solving practical real-world problems. This project-based curriculum focuses on the use of the 21st Century Skills of collaboration, creativity, critical thinking and communication to engineer solutions to a series of problems. Students will follow the 8 step EDP from identification of the problem, through solution brainstorming, design, prototyping and testing and apply them to a design challenge. Students also learn the fundamentals of engineering drawing and create a series of orthographic and isometric drawings. 6th grade students learn gears and other simple machines and build and test Lego™ vehicles; 7th grade students learn gears and other simple machines and build, code and test Lego Mindstorms™ robots. For the final project, students are introduced to basic woodworking hand tools and safety and use computers to produce templates for the final woodworking project. Throughout the course students maintain a professional engineering record (journal) of all activities and projects. Innovative Design Challenge is an 8th grade STEM course designed to build upon the student’s technical knowledge gained in the Intro to Technology/Technical Education course taken in grades 6 or 7, which is generally a prerequisite for entry into this elective course. Students in this advanced class demonstrate the application of the Engineering Design Process (EDP) to the solution of practical real-world problems. This project-based curriculum focuses on the use of the 21st Century Skills of collaboration, creativity, critical thinking and communication to engineer solutions to a series of problems. Students will follow the 8 step EDP from identification of the problem, through solution brainstorming, design, prototyping and testing. The student-centered course focuses on a series of projects that afford students exposure to a series of problems that create opportunities for higher order learning such as analysis, evaluation and creation, while also advancing their “maker skills”. During the design, engineering and development of their final project, students will apply their knowledge of science and mathematics, engineering drawing to develop a functional and testable product, all while maintaining a professional engineering record (journal) from concept to completion. This nine-week cycle course introduces the students to the digitalization of our world and its impact through the guise of news media. The digital presentation of every part of our lives builds the need to provide students with guidance in reading, reviewing, and publishing news on the internet. Digital journalism is the focus for representing the basic principles of responsible digital learners. The students will engage in the process of gathering factual information, organizing their ideas, formatting their writing, and editing it for digital publication. Exploration into Coding and Robotics is a cycle course that is transitioning to meet the needs of ever changing technological world. It will also serve as an introduction to more advanced courses available in high school. The core topics covered during the course will be Robotics and Coding.. The hands-on activities will vary in level of complexity depending on the previous experiences of the students. During the quarter, the students will use various data and design applications to enhance the learning and connect it to real life experiences.